Here on the BackyardRanch, cockleburs have been a problem. Our weed control program is working but very slow. We are on constant cocklebur removal from our little remuda, and will be until we get rid of all the cocklebur plants. Cockleburs are a broadleaf weed that produces a small egg shaped spiny bur. These burs get tangled in horse hair worse than anything I have seen. They make a huge spiny mat as several of them get tangled up. After the hair is so tangled, they are nasty to remove. Making scissors and sacrifice of mane and tail a viable option. We have found a way to remove the cockleburs from horse manes and tails. You will need some inexpensive tools: cooking oil/corn oil, a squeeze bottle and a horse hair comb or horse hair rake. Pour the cooking oil in the squeeze bottle. Start combing at the bottom of the mane or tail and comb up to the bottom of the burr or mat. This way the bur will slide free of the rest of the hair. Pour the cooking oil from your squeeze bottle just above and onto the mat and burs, doesn’t take much. Use the comb or rake to comb out the burs from the mat. It takes some coaxing. 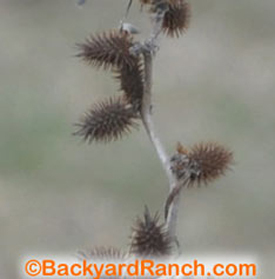 Make sure that when the burs are removed that you get rid of them or where they land, another plant will grow with dozens more cockleburs. They can go in the fireplace, branding fire or woodstove. Rinse the excess cooking oil out of the mane and tail with a good quality horse shampoo and conditioner. 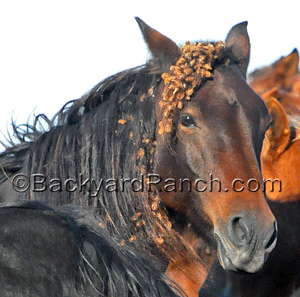 It is important to keep the mane and tail groomed at this point forward to keep cockleburs from creating such a mat. They should slide out easier from groomed horse hair. manes and tails much better than us spending all day sorting and pulling hair with sore fingers pulling out the burs. Dry combing the burs out yanks the mane and tail hair out. Cutting the mane and tail prevents the horse from chasing off biting insects.